Reynaldo Hahn (1875–1947) has been dismissed as ‘a talented gossip who had a gift for grinding out operettas and little, tastefully performed ballads in limitless quantities’ (H H Stuckenschmidt in Maurice Ravel, Calder & Boyars, 1969). Martin Cooper, on the other hand (French Music, Oxford University Press, 1961), takes a more sympathetic view, likening his fluency and melodic charm to the English composer Roger Quilter, especially in his songs. Certainly the captious ‘in limitless quantities’ is something of an exaggeration, for Hahn wrote some sixty or so songs; and a fair proportion of them date from pretty early in his career. Hahn was born of mixed parentage (German father and Spanish mother; his name therefore is pronounced with an aspirated initial H—not in the French way, ‘ahn’) in Caracas, Venezuela. He was the youngest of twelve children. When he was three, the family moved to Paris where the boy showed an early aptitude for music. At the age of eleven he was a student at the Conservatoire where he studied composition with Massenet. To the end of his career his style bore the marks of his teacher’s suave and fluent lyricism. He was recognized long before his student days were over as a talented lyricist: Alphonse Daudet, the dramatist for one of whose works Bizet composed the famous L’Arlésienne music, commissioned Hahn to write the incidental music to his play L’Obstacle when he was a mere fifteen years of age. Hahn was always attracted by the stage and was a connoisseur of literature: in 1894 he met Marcel Proust and the famous novelist drew upon Hahn’s character and outlook for the portrait of the musician Santeuil. As a conductor and critic, too, Hahn was active throughout his career, holding a number of posts on influential periodicals and eventually taking charge of the Paris Opéra in the final two years of his life. Hahn was enough of a scholar to edit some of the works of Rameau; and his scholarship is evident in his ability to write pastiche of effective kind, as one or two of the songs on this disc show. One of his numerous stage works is a light musical piece on the subject of Mozart, a composer whose music he adored. His tastes ranged from Palestrina (‘shattering’) to Ravel (though he did not unequivocally like Debussy). Haydn’s music he found ‘exquisite, powdered and occasionally provocative … poses, gestures but no depth’. Wagner fascinated him without necessarily showing much influence on his style. Beethoven, he said, ‘transports us by the mere vibration of his soul’. But his real gods were Mozart and, in the realm of song, Schumann, of whom he wrote: ‘There is no emotion that he has not experienced: all the phenomena of nature are familiar to him—moonlight bright or hazy, sunrise and sunset, confused shadows, dull weather, radiant weather, fresh scents, the majesty of evening, swirling mists, powdery snow—he has known them all and can impart to us the thousand-and-one emotions associated with them. His Lieder encompass the entire art of melody. Schubert’s genius was as a ‘composer of romances, but Schumann combines depth of expression and sincerity of emotion with respect for the [poem’s] meaning and delicacy of touch. What a prodigious feeling for literature he had! For me, obsessed as I am with the fusion of literature and music, that is the quality that counts first and foremost.’ This range of tastes and styles is some indication why his gently sentimental style rarely degenerates into mawkishness and banality. The majority of the songs in this recital date from the 1890s, but of the ‘naughty’ nineties there are very few traces indeed, either in the texts or in the music. They all follow the tradition of the salon ballad. Hahn, however, displays a sureness of touch and an ability to colour the moods of the poem in the music that far transcend the ballad-mongers with whom he is so frequently and thoughtlessly classed. À Chloris, the last song of this collection to be published (1916) is, oddly enough, the most archaic in style—a pseudo-Baroque pastiche of great charm and dignity admirably suited to the text by the seventeenth-century poet Théophile de Viau (1590–1626). Tyndaris, to a poem by the neo-classicist Leconte de Lisle (1818–1894) is a subtle piece in which the piano’s opening phrase is used as a kind of motto. The striking, almost monotonous recitative-like voice part in La chère blessure starts out as if it were a mere counterpoint to the tune in the piano part, but it develops a momentum of its own. L’air conveys the sense of the words with an accompaniment as light as gossamer and a vocal line that makes its point by skilful use of syncopation. Quand je fus pris au pavillon is to a poem by Charles, Duke of Orleans (1394–1464). Hahn, ever the stylistic chameleon, matches the ancient poem with a delightfully mock-archaic style. Les étoiles (poem by Théodore de Banville, 1823–1891) shows the composer’s skill in building up to a climax by intensifying and then relaxing the rhythm of the accompaniment. L’automne (also by de Banville) is in a 7/4 metre and subtly combines mellow regret with a kind of exhilaration admirably suited to the mood of the text. Infidélité is a setting of a poem by Théophile Gautier (1811–1872), the apostle of the doctrine of art for art’s sake (de Banville was one of his followers). Both here and in L’enamourée (text by de Banville), Hahn shows a suppleness of melodic inflexion and a capacity to convey an atmosphere that is almost visual. Si mes vers avaient des ailes is probably Hahn’s best-known song. The text is by Victor Hugo (1802–1885), and Hahn’s setting dates from 1888, when he was a mere thirteen years old. Even if he was no Mozart at the time, he already possessed a memorable suppleness of melodic gift and the ability to write an effective illustrative accompaniment, allied to a fine sense of harmonic colour. Few French composers of that age—Fauré alone excepted—could match the sheer technical skill of this piece. However well he set other French poets of his age, it was to the subtly musical verse of Paul Verlaine (1844–1896) that Hahn responded most fully. Other composers—notably Fauré—invested Verlaine’s poetry with a dignity that possibly reads more into the verse than is there: none caught the elusive and allusive atmosphere of the poems better than Hahn. 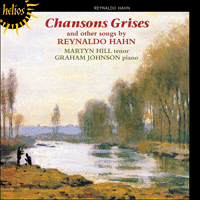 The Chansons Grises, dating astonishingly enough from 1891/2, display a maturity of technique quite remarkable in a sixteen-year-old—and an empathy with the poet quite unexpected in a musician of any age. It is as if Verlaine himself had composed the music—a fact that the poet might wryly have appreciated, for his aesthetic credo stressed the musicality of verse; and his somewhat irresponsible comment on the imminent entry of the Prussian army into Paris in 1870—‘Good: that means we shall have some decent music’—is too notorious to need comment. Chanson d’automne is a languid, perfumed piece; the very simple accompaniment echoes the vocal line to create the requisite drowsy atmosphere. Tous deux, with its rippling accompaniment, conjures up the radiance of the scene and the subdued ecstasy of the lovers—Hahn never takes the voice part above mezzo forte and throughout resists the temptation to paint in emotive details such as ‘shimmers’ and ‘shivers’ because the point of the poem is that it refers to future hopes, not present delights. L’allée est sans fin, with its gentle syncopated piano accompaniment and very restrained voice part, is an imaginative triumph. En sourdine and L’heure exquise contrast finely with one another as portrayals of tender calm; and the ‘greyness’ of Paysage triste, with its drifting arpeggios that seem almost as if the pianist is improvising them on the spot, and the unaccompanied first entry of the voice, can be unforgettable. The big broad phrases of La bonne chanson are a complete contrast; and its self-confident declamatory style is quite different (and perhaps more conventional) than the rest of the cycle. Offrande also dates from 1891 and, like the other Verlaine settings, shows an enviable mastery of harmony and ability to colour the mood of the poem through the accompaniment for a boy of sixteen. L’incrédule is slightly later (it dates from 1893) and skilfully conveys the contrast between the credulous, superstitious young lady and her sceptical lover who doubts everything except her charms. Fêtes galantes and D’une prison, the one with its almost Watteau-esque delicacy and most un-Victorian rhythmic flexibility, and the other with its insistently gentle chords in fifths in the right hand against the voice part, draw a fine contrast between idyllic calm and pathos—a technique of which Hahn was a master throughout his career. Reynaldo Hahn (1875–1945) a été pris pour «un bavard talentueux, doué pour pondre des opérettes et des quantités illimitées de petites ballades interprétées avec goût» (H. H. Stuckenschmidt, dans Maurice Ravel, Calder & Boyars, 1969). Martin Cooper, mieux disposé, rattache sa fluidité et son charme mélodique au compositeur anglais Roger Quilter, surtout dans ses mélodies (French Music, Oxford University Press, 1961). Le captieux «quantités illimitées» relève assurément de l’exagération, car Hahn écrivit une soixantaine de mélodies, datant, pour une bonne part, des tout débuts de sa carrière. Hahn naquit d’un mariage mixte (père allemand, mère espagnole; son nom se prononce donc avec un «h» initial aspiré, et non à la française, «ahn»), à Caracas, au Venezuela. Benjamin de douze enfants, il avait trois ans lorsque sa famille s’installa à Paris, où il manifesta une aptitude précoce pour la musique. À onze ans, il étudia la composition avec Massenet, au Conservatoire, et, jusqu’à la fin de sa carrière, son style porta le sceau du lyrisme suave et fluide de son maître. Bien avant la fin de ses études, il fut reconnu comme un mélodiste talentueux et il avait à peine quinze ans lorsque Alphonse Daudet—dont Bizet utilisa l’une des œuvres pour composer sa célèbre L’Arlésienne—lui commanda une musique de scène pour sa pièce de théâtre L’Obstacle. Connaisseur en littérature, Hahn fut toujours attiré par la scène: en 1894, il rencontra Marcel Proust, qui s’inspira du caractère et de la silhouette de Hahn pour brosser le portrait du musicien Santeuil. Également chef d’orchestre et critique, Hahn mena une carrière active, occupant un certain nombre de postes au sein de périodiques influents, avant de finalement prendre en charge l’Opéra de Paris, dans les deux dernières années de sa vie. Hahn fut suffisamment érudit pour éditer certaines œuvres de Rameau—et cette érudition transparaît dans sa capacité à écrire des pastiches efficaces, comme l’attestent une ou deux mélodies du présent récital. Parmi ses nombreuses œuvres de scène figure une pièce musicale légère sur Mozart, dont il adorait la musique. Ses goûts allaient de Palestrina («bouleversant») à Ravel (même s’il n’aimait pas clairement Debussy). Il trouvait la musique de Haydn «exquise, poudrée, parfois provocatrice … des poses, des gestes, mais nulle profondeur». Wagner le fascina, sans pour autant beaucoup l’influencer. Beethoven, disait-il, «nous transporte par la simple vibration de son âme». Mais ses vrais dieux étaient Mozart et, au royaume du lied, Schumann, à propos duquel il écrivit: «Il n’est pas une émotion qu’il n’ait ressentie: tous les phénomènes de la nature lui sont familiers—le clair de lune, éclatant ou embrumé, le lever et le coucher du soleil, les ombres indistinctes, le temps maussade, le temps radieux, les senteurs fraîches, la majesté du soir, les brumes tournoyantes, la neige poudreuse—il les a tous connus et peut nous transmettre les mille et une émotions à eux associées. Ses Lieder embrassent l’art entier de la mélodie. Schubert était un compositeur de romances de génie, mais Schumann marie profondeur d’expression et sincérité d’émotion, en respectant la signification et la délicatesse de toucher (du poème). Quel prodigieux sens de la littérature il avait! Pour moi qui suis obsédé par la fusion de la littérature et de la musique, c’est la qualité qui compte en tout premier lieu.» Cette palette de goûts et de styles concourt à expliquer pourquoi son idiome doucement sentimental dégénère rarement en mièvrerie et en banalité. La plupart des mélodies du présent récital datent des années 1890, mais les textes, comme les musiques, ne recèlent que de rarissimes traces de ces années «osées». Toutes ces pièces suivent la tradition de la ballade de salon. Toutefois, Hahn fait montre d’une sûreté de toucher et d’une capacité à colorer musicalement les atmosphères du poème qui transcendent de beaucoup les marchands de ballades au rang desquels il est si souvent, et si inconsidérément, classé. À Chloris, dernière mélodie publiée (1916) du présent corpus, présente, assez curieusement, le style le plus archaïque—pastiche pseudo-baroque de grand charme, d’une dignité admirablement appropriée au texte du poète Théophile de Viau (1590–1626). Tyndaris, sur un poème du néo-classique Charles Leconte de Lisle (1818–1894), est une pièce subtile, où la phrase d’ouverture pianistique sert un peu de motif conducteur. La saisissante partie mélodique quasi monotone, en style récitatif, de La chère blessure, débute comme un simple contrepoint à la mélodie de la partie de piano, mais développe un élan propre. L’air véhicule le sens des mots à l’aide d’un accompagnement arachnéen et d’une ligne vocale usant habilement de la syncope. Dans Quand je fus pris au pavillon, sur un poème de Charles duc d’Orléans (1394–1464), le caméléonesque Hahn égale le poème ancien avec un style délicieusement pseudo-archaïque. Les étoiles (poème de Théodore de Banville, 1823–1891) révèle combien le compositeur maîtrisait l’élaboration d’un apogée, en intensifiant puis en relâchant le rythme de l’accompagnement. L’automne (également de de Banville), sise dans un mètre à 7/4, combine subtilement le doux regret à une sorte d’exaltation admirablement appropriée à l’atmosphère du texte. Infidélité est la mise en musique d’un poème de Théophile Gautier (1811–1872), apôtre de l’art pour l’art (de Banville fut l’un de ses disciples). Ici, comme dans L’enamourée (texte de de Banville), Hahn démontre une souplesse d’inflexion mélodique et une capacité à véhiculer une atmosphère quasi visuelle. Si mes vers avaient des ailes est probablement la plus fameuse mélodie de Hahn. Le compositeur réalisa la mise en musique de ce texte de Victor Hugo (1802–1885) en 1888, à tout juste treize ans. Bien que n’étant pas Mozart, il était déjà doué d’une mémorable souplesse mélodique et d’une aptitude à écrire un efficace accompagnement illustratif, alliées à un beau sens de la couleur harmonique. Peu de compositeurs français, ôté Fauré, pouvaient, à cet âge, égaler l’absolue maîtrise technique de cette pièce. Quelque réussies que furent ses mises en musique de textes d’autres poètes français de son temps, ce fut au vers subtilement musical de Paul Verlaine (1844–1896) que Hahn répondit le plus parfaitement. D’autres compositeurs—notamment Fauré—revêtirent la poésie verlainienne d’une dignité peut-être plus attentive aux vers, mais personne mieux que Hahn n’appréhenda l’atmosphère élusive et allusive de ces poèmes. Les Chansons Grises (datant, assez remarquablement, de 1891/2) font montre d’une maturité technique des plus exceptionnelles pour un jeune homme de seize ans—et d’une affinité avec le poète tout à fait inhabituelle pour un musicien. Tout semble comme si Verlaine lui-même avait composé la musique—ce que le poète aurait pu, ironiquement, apprécier, car son credo esthétique mettait l’accent sur la musicalité de la poésie; et sa remarque, quelque peu irréfléchie, sur l’entrée imminente de l’armée prussienne dans Paris, en 1870 («Bien: cela signifie que nous aurons de la musique décente»), est suffisamment connue pour se passer de commentaires. Chanson d’automne est une pièce languide, parfumée, dont l’accompagnement fort simple fait écho à la ligne vocale pour créer l’atmopshère engourdie requise. Tous deux, avec son accompagnement gazouillant, évoque le caractère radieux de la scène et l’extase contenue des amoureux—Hahn ne fait jamais dépasser le mezzo forte à la partie mélodique et, de bout en bout, résiste à la tentation de peindre en détails émotionnels («frissonnera»), car l’argument du poème fait référence aux espérances à venir, non aux délices présents. L’allée est sans fin, avec son doux accompagnement pianistique syncopé et sa partie mélodique toute en retenue, est un triomphe d’imagination. En sourdine et L’heure exquise contrastent joliment, portraits du calme tendre; la «grisaille» de Paysage triste, avec ses arpèges nonchalants simulant une improvisation ex abrupto du pianiste, et la première entrée, a capella, de la voix, peut se révéler inoubliable. Les phrases imposantes et amples de La bonne chanson forment un complet contraste; son style déclamatoire, assuré, est fort différent du reste du cycle (et, peut-être, davantage conventionnel). Offrande (1891) dévoile, à l’instar des autres mises en musique de textes verlainiens, une enviable maîtrise de l’harmonie et une capacité à colorer l’atmosphère du poème par le truchement de l’accompagnement—Hahn avait seulement seize ans. L’incrédule, légèrement postérieure (1893), véhicule adroitement le contraste entre la jeune femme crédule, superstitieuse, et son amant sceptique, doutant de tout sauf des charmes de la belle. Fêtes galantes et D’une prison—l’une d’une délicatesse presque alla Watteau, d’une flexibilité rythmique tout sauf victorienne, l’autre avec des accords fermement doux, en quintes, à la main droite, contre la partie mélodique—dessinent un élégant contraste entre calme idyllique et pathos—une technique dont Hahn demeura maître au long de sa carrière. Reynaldo Hahn (1875–1947) ist von H. H. Stuckenschmidt (in Maurice Ravel, 1969) abfällig als talentiertes Klatschmaul beschrieben worden, mit einer Gabe für das Verfassen von Operetten und kleinen, geschmackvoll dargebotenen Balladen in unbegrenzten Mengen. Martin Cooper (in French Music, 1961) schätzt ihn hingegen positiver ein—er vergleicht ihn, was seine Gewandtheit und den melodischen Charme insbesondere seiner Lieder angeht, mit dem englischen Komponisten Roger Quilter. Das überkritische „in unbegrenzten Mengen“ ist auf jeden Fall eine Übertreibung, denn Hahn schrieb etwa 60 Lieder, von denen zahlreiche aus den frühen Jahren seiner Karriere stammen. Hahn wurde im venezolanischen Caracas geboren; seine Eltern waren unterschiedlicher Herkunft (der Vater deutsch, die Mutter spanisch, weshalb sein Name wie im Deutschen mit Anfangs-H, nicht wie im Französischen „-ahn“ ausgesprochen wird). Er war das jüngste von zwölf Kindern. Als er drei Jahre alt war, zog die Familie nach Paris, wo der Junge schon früh musikalische Begabung erkennen ließ. Mit elf Jahren studierte er bereits am Konservatorium und nahm dort Kompositionsunterricht bei Massenet. Bis zum Ende seiner Karriere wies sein Stil Anzeichen des verbindlichen und gewandten Lyrismus seines Lehrers auf. Lange vor seinem Studienabschluß war er bereits als talentierter Gestalter lyrischer Werke bekannt; der Dramatiker Alphonse Daudet, zu dessen Drama L’Arlésienne Bizet seine berühmte Bühnenmusik schrieb, gab die Musik zu seinem Stück L’Obstacle bei Hahn in Auftrag, als dieser gerade erst fünfzehn Jahre alt war. Hahn fühlte sich von Anfang an zum Theater hingezogen und war ein Literaturkenner: 1894 lernte er Marcel Proust kennen, und der berühmte Schriftsteller ließ sich bei der Darstellung des Musikers Santeuil von Hahns Charakter und Lebenseinstellung leiten. Auch als Dirigent und Kritiker war Hahn sein ganzes Berufsleben lang tätig. Er hatte eine Anzahl Posten bei einflußreichen Zeitschriften inne und übernahm schließlich in den letzten beiden Lebensjahren die Leitung der Pariser Opéra. Hahn war musikwissenschaftlich versiert genug, um Werke von Rameau herauszugeben, und seine Gelehrsamkeit wird daran deutlich, daß er wirkungsvolle Pasticcios zu schreiben verstand, was das eine oder andere der vorliegenden Lieder belegt. Eins seiner zahlreichen Bühnenwerke ist eine musikalische Komödie zum Thema Mozart, dessen Musik er über alles liebte. Seine Vorlieben reichten von Palestrina („erschütternd“) bis hin zu Ravel (nur Debussy befürwortete er nicht uneingeschränkt). Die Musik Haydns fand er „exquisit, gepudert, und gelegentlich provokativ … Posen, Gesten, aber ohne Tiefgang“. Wagner faszinierte ihn, ohne daß ihn sein Stil wesentlich beeinflußt hätte. Beethoven, meinte er, „überwältigt uns durch das bloße Erbeben seiner Seele“. Doch seine wahren Götter waren Mozart und im Bereich des Liedes Schumann, über den er schrieb: „Es gibt keine Emotion, die er nicht verspürt hätte: Sämtliche Naturphänomene sind ihm vertraut—Mondlicht, ob hell oder dunstig, Sonnenauf- und untergang, wirre Schatten, trübes Wetter, strahlendes Wetter, frische Düfte, die Majestät des Abends, wabernde Nebel, Pulverschnee—er hat sie alle erfahren und kann uns tausendundein damit verbundene Gefühle vermitteln. Seine Lieder beinhalten die gesamte melodische Kunst. Schuberts Genie lag im Komponieren von Romanzen, doch Schumann verbindet Ausdruckstiefe und ehrliche Emotion mit Respekt für den Gehalt (des Gedichts) und Feingefühl. Welch außerordentliches Gespür für Literatur besaß er doch! Für mich, der ich besessen bin von der Verschmelzung von Literatur und Musik, ist das die Eigenschaft, die zuvörderst zählt.“ Diese breite geschmackliche und stilistische Palette mag als Hinweis darauf dienen, warum Hahns eigener sanft kultivierter Stil selten in Rührseligkeit und Banalität abgleitet. Die vorliegenden Lieder stammen in der Mehrzahl aus den 1890er Jahren, aber von den „frivolen Neunzigern“ ist darin kaum etwas zu spüren, weder in den Texten noch in der Musik. Alle Stücke folgen der Tradition der Salonballade, doch beweist Hahn eine Stilsicherheit und eine Fähigkeit, die Stimmungen des Textes in Musik umzusetzen, die ihn weit über die Balladenschmiede erheben, mit denen er so oft gedankenlos in einen Topf geworfen wird. À Chloris, als letztes Lied dieses Programms veröffentlicht (1916), ist vom Stil her seltsamerweise fast das altertümlichste—ein pseudobarockes, ausgesprochen charmantes und würdevolles Pasticcio, das bewundernswert gut auf den Text des Barockdichters Théophile de Viau (1590–1626) paßt. Tyndaris auf ein Gedicht des Neoklassizisten Charles Leconte de Lisle (1818–1894) ist ein feinsinniges Stück, das die einleitende Phrase des Klaviers als eine Art Motto verwendet. Der auffallende, fast monotone Gesangspart von La chère blessure beginnt, als sei er ein bloßer Kontrapunkt zur Melodie im Klavier, entwickelt dann jedoch ein Eigenleben. L’air vermittelt den Sinn der Worte mit einer Begleitung so zart wie Spinnfäden und einer Gesangslinie, die sich durch geschickten Einsatz von Synkopen auszeichnet. Quand je fus pris au pavillon vertont ein Gedicht des Herzogs Karl von Orleans (1394–1464). Hahn, der seinen Stil stets chamäleonartig anzupassen wußte, hat seine wunderbar pseudoarchaische Stimmführung auf den uralten Text abgestimmt. Les étoiles (Text von Théodore de Banville, 1823–1891) beweist die Fähigkeit des Komponisten, einen Höhepunkt anzusteuern, indem er den Rhythmus der Begleitung verschärft und dann wieder entspannt. L’automne (ebenfalls de Banville) steht im 7/4-Takt und verbindet abgeklärtes Bedauern subtil mit einer Form von Hochgefühl, die der Stimmung des Textes bewundernswert angemessen ist. Infidélité ist die Vertonung eines Gedichts von Théophile Gautier (1811–1872), dem Apostel der Doktrin des L’art pour l’art (de Banville war einer von seinen Anhängern). Sowohl hier als auch in L’Enamourée (de Banville) beweist Hahn Geschmeidigkeit des melodischen Tonfalls und die Fähigkeit, eine Atmosphäre fast schon visuell wahrnehmbar darzustellen. Si mes vers avaient des ailes ist wohl Hahns bekanntestes Lied. Der Text stammt von Victor Hugo (1802–1885), und Hahns Vertonung entstand 1888, als er erst dreizehn Jahre alt war. Er mag damals kein Mozart gewesen sein, doch war er melodisch bereits erstaunlich gewandt, wußte eine wirkungsvoll illustrative Begleitung zu schreiben und verband damit ein fabelhaftes Gespür für abwechslungsreiche Harmonik. Nur wenige französische Komponisten jener Zeit—mit Ausnahme von Fauré—konnten sich mit dem schieren technischen Können dieses Stücks messen. Wie gekonnt er auch die Werke anderer französischer Dichter seiner Zeit vertont haben mag: Am überzeugendsten sprach Hahn auf die subtil musikalischen Verse von Paul Verlaine (1844–1896) an. Andere Komponisten—insbesondere Fauré—haben der Dichtung Verlaines eine Würde verliehen, die in seine Verse womöglich mehr hineinliest, als in ihnen steckt: Keiner hat die schwer definierbare und anspielungsreiche Atmosphäre der Gedichte besser eingefangen als Hahn. Die Chansons Grises, die erstaunlicherweise aus dem Zeitraum 1891/92 stammen, künden von einer kompositionstechnischen Reife, die für einen Sechzehnjährigen recht bemerkenswert ist—und von einer Einfühlung in den Dichter, die bei einem Musiker, gleich welchen Alters, eher überrascht. Es ist, als habe Verlaine selbst die Musik komponiert—eine Tatsache, die der Dichter mit einem Anflug von Ironie zu würdigen gewußt hätte, betonte sein ästhetisches Kredo doch die Musikalität jeglicher Lyrik; und sein unverantwortlicher Kommentar zum bevorstehenden Einmarsch des preußischen Heeres in Paris im Jahre 1870—„Gut; das heißt, daß wir anständige Musik zu hören kriegen“—ist zu berüchtigt, um eines Kommentars zu bedürfen. Chanson d’automne ist ein mattes, duftiges Stück; die äußerst schlichte Begleitung imitiert die Gesangslinie, um die verlangte schläfrige Atmosphäre herzustellen. Tous deux beschwört mit seiner perlenden Begleitung die herrliche Szene und die gedämpfte Ekstase der Liebenden herauf—Hahn läßt die Gesangsstimme nie lauter als mezzo forte erklingen und widersteht durchweg der Versuchung, gefühlsbetonte Details wie „Schimmern“ und „Erzittern“ auszumalen, denn das Gedicht bezieht seinen Sinn aus Hoffnungen auf die Zukunft, nicht aus gegenwärtigen Freuden. L’allée est sans fin ist mit seiner sanft synkopierten Klavierbegleitung und dem äußerst zurückhaltendem Gesangspart ein Triumph der Phantasie. En sourdine und L’heure exquise kontrastieren als Darstellungen zärtlicher Stille raffiniert miteinander; und das „Graue“ an Paysage triste, dessen dahintreibende Arpeggien vom Pianisten auf der Stelle improvisiert erscheinen, und der unbegleitete erste Einsatz der Stimme können einen unvergeßlichen Eindruck hinterlassen. Die großangelegten Phrasen von La bonne chanson stehen dazu in völligem Gegensatz; es ist mit seinem selbstbewußt deklamatorische Stil ganz anders (und wohl auch konventioneller) als der Rest des Zyklus. Auch Offrande stammt aus dem Jahr 1891 und beweist wie die anderen Verlaine-Vertonungen für einen Jungen von sechzehn Jahren beneidenswerte Meisterschaft im Umgang mit der Harmonik sowie das Vermögen, über die Begleitung die Stimmung des Gedichts zu nuancieren. L’incrédule entstand etwas später (nämlich 1893) und vermittelt geschickt den Kontrast zwischen der naiven, abergläubischen jungen Dame und ihrem skeptischen Liebhaber, der an allem zweifelt, außer an ihren Reizen. Fêtes galantes und D’une prison—das eine Lied mit an Watteau gemahnender Finesse und unzeitgemäßer rhythmischer Flexibilität, das andere mit beharrlich sanften Quintenakkorden der rechten Hand, die der Gesangsstimme gegenüberstehen—schaffen einen gelungenen Gegensatz zwischen idyllischer Ruhe und Pathos, eine Technik, die Hahn während seiner gesamten Laufbahn meisterhaft beherrschte.